If I’m being honest, I haven’t always known if I wanted to get married or not. Here’s (part of the reason) why. As much as I love the romanticism of the idea of “soulmates” and “the ONE”, the reality is that there are a hell of a lot of people in this world. Ex-NASA roboticist Randall Munroe calculated that there are approximately 5,000,000,000 people, living or dead, who are statistically likely to satisfy your “soul mate” criteria. That’s a whole lot of people. Modern advances in technology (the internet, cell phones, dating apps, social media) have made it quite easy to become connected to more of these potential partners. All of these options have their benefits, but also make modern dating more complicated and more confusing*. Think about it. 50 years ago, if you got married, you weren’t able to simultaneously keep tabs on an ex while also scoping out other potential partners online – intentionally or not. Today you can. 50 years ago you also weren’t constantly comparing yourself to the happy snapshots of everyone else’s relationship that they post online. Today we are. This leads to an all-too-common game of comparisons and assumption of, “they look so happy and in love, so why aren’t we like that?” It’s difficult to sort through the facades of “perfect” looking relationships and know who is actually struggling underneath all of the filters and sweet captions. We’ve created a modern dating world that cultures an ADD-like response, making it difficult to feel satisfied and totally sure that we’re with the right person. Our arousal templates have become accustomed to, if not dependent upon, novelty and changing partners, and we have access to our options at all times. ON TOP OF ALL OF THIS, people often forget that (at least according to Helen Fisher**) love has three stages: lust, attraction, and attachment. Most people think that these first two stages (lust and attraction) feel the best. Those are the giddy, romantically and sexually charged and exciting stages. The 3rd stage of love – attachment – is the longest lasting and is often times a lot less “exciting”, yet often times people assume being in love should feel like being in lust. It is easy to see, then, why people’s expectations of what love and marriage should feel and be like may be skewed. No one talks (or posts) about the mundane stuff that makes a relationship or the times that they noticed someone other than their spouse or partner was attractive. Far too often I have clients and friends come to me concerned that they’re in the wrong relationship because the butterflies (AKA lust and attraction stages full of raging hormones) have faded. We don’t talk about the fact that this progression is completely normal. No wonder so many people get divorced or engage in extramarital affairs. No wonder that the idea of getting married can seem intimidating. And then we reap the benefits. Attachment and commitment is beautiful. It’s secure, it’s safe, it’s deep. But finding a person that you’re willing to get past the butterflies with… it’s a choice. I mean that in several ways. Not only are we choosing the action of getting married, but marriage is also choosing that person on the day you marry and every day from then on. This may sound simple, but for me it was a realization that was both profound and comforting in its simplicity. The reality is, our bodies can only sustain those surges of testosterone, dopamine, estrogen, norepinephrine and depletion of serotonin responsible for lust and attraction in our bodies for 12-18 months. I’m sure about now some of you may be thinking, “I don’t know… What about those people I know that have been hopelessly and giddily in love for 50 years?” That’s great! What they have been doing is choosing each other for the last 50 years. Choosing to cultivate their relationship. Choosing to put that effort in and not become roommates or bystanders in their own love story. All of that choice is what makes the other part come naturally, and this is exactly what I’m talking about. What are you willing to do when those lovey dovey feelings come and go the more you get to know your partner? Would you be willing to still choose them? Choose them for emotional and physical connection. Choose to share your life with them. Choose to be faithful and not act on fleeting attractions to other people. Choose to be kind. Choose to build a life with this person, and continue to make choices to make it the best life it can be. Choose to do things together to recreate the hormone-driven early days of your relationship. 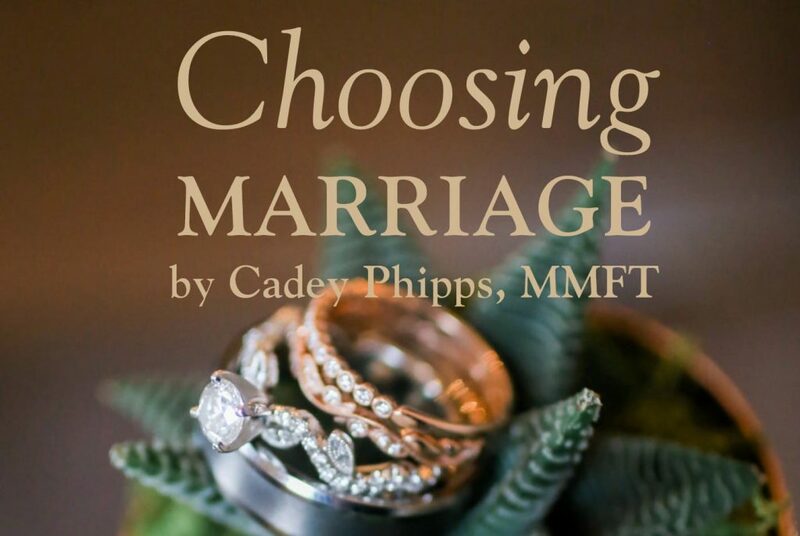 Because when you choose marriage, you’re choosing to make your partner “the one” for you. I could talk about this all day. Contact me to schedule a session or to explore these concepts more.